As part of BIG's role in promoting excellence in science communication we are pleased to announce our upcoming skills day. Do you work in a university to support public engagement with research? Have you been asked to develop and deliver training or professional development for scientists? If you said yes to either question, then this BIG Skills Day is for you! In this highly practical day, we’ll share our experiences of developing training and professional development specifically for researchers. We’ll look at what makes for effective training, different types of intervention, participants’ needs and evaluating the effectiveness of training. Bring your experiences to share and any challenges you’re encountering. Have personal advice and support for any challenges you are facing. Who is the day for? People who want to advance their training and knowledge of working with researchers. This skills day is part of the University of Bath’s ChallengeCPD project. Helen will share findings from this work which is looking at why training for public engagement can be a challenging area. Non-members will need to join BIG first at an annual cost of £30 and then come back to register for the day as a member. The Little Event is BIG’s one-day training session for people who are relatively early in their STEM communication career, whether they work in a science centre or museum, volunteer for a festival, are involved in university outreach, or do anything else to engage people with sciences. It’s a lot like the BIG Event, but a bit smaller, and all crammed into one busy day. There will be several sessions, each focusing on developing a different skill, including sessions on Networking, Managing Projects, Presenting, Audience Analysis and Careers. Each bursary is worth approximately £100 and covers annual BIG membership, registration fees and reasonable expenses. Applying for one of the 10 free places is simple. Click here to apply and tell us in no more than 200 words, why you would like the opportunity to come to the Little Event and how you think it will benefit your personal and professional development. Applications close at 6pm, 5th December, 2019. Applicants will be notified of the outcome the week commencing 17th December, 2019. The Little Event will take place again on Thursday, 24th January, 10am - 4:30pm at Thinktank Birmingham Science Museum. The Little Event is BIG’s one-day mini-conference for people who are new to STEM communication, whether you work in a science centre or museum, volunteer for a festival, are involved in university outreach, or do anything else to engage people with science, technology, engineering and maths. The day is crammed with introductory sessions focusing on developing the different skills that are useful in STEM communication; they are delivered by experienced science communicators following BIG's usual hands-on approach. But of course, it isn't just about the sessions, it’s the people you meet there, too. The Little Event also presents a great opportunity to meet people from across the UK working in similar roles and sharing similar experiences. The programme for the day includes sessions on Networking, Managing Projects, Presenting, Audience analysis and Careers. The Little Event costs £45 for BIG members. If you are not a member, you need to join BIG at an annual cost of £30. Do you talk about your business? Would you to like get more engagement? Would it be great if your messages where remembered? Then this session is for you. You hear a lot about business storytelling at the moment – it’s somewhat in Vogue. But what does it actually mean? In this session Duncan will take you through the reasons storytelling can be exciting in business, and how you can apply this centuries old art to transform your ideas, projects and products. Concepts from storytelling are crucial to creating engaging communications, particularly in presentation but also in marketing, social, and in business processes. We’ll create a compelling business story, explore some techniques and take the time to think a little differently. The UK science festival ecosystem is diverse and constantly evolving, but we rarely take the time to celebrate what we have achieved or to look ahead to some of the challenges and opportunities for the sector. This is where the UK Science Festivals Network come in - they bring together science festivals and non-science festivals with scientific content to consider the highs, lows and future of festival organisation and management. Following the success of the first UKSFN conference in Edinburgh last year, the UK Science Festivals Network are re-lighting the fire again, this time in Swansea on 21st November. Join them to discuss best practice in diversifying audiences and speakers, workshop new approaches to programming and learn what else is happening beyond the UK, amongst other topics. Most importantly, there will be plenty of opportunities to network and socialise with other conference attendees - if only it serves to reassure you that you're not alone in this crazy little science engagement bubble! Hosted by the National Waterfront Museum in Swansea. Please arrive at 9.30 for a 10.15 start, the day will end at 17.15. Delegates are also invited to a drinks reception from 17.15 onwards. The venue will not be open before 9.30 so do bear that in mind. Tickets + more info available here. The National Forum for Public Engagement with STEM, a group that comprises Government, funders of STEM engagement across the UK, and the key national networks (ASDC, NCCPE, BSA) are hosting a national networking event on November 1st from 11am to 5.30pm in Central London. Development and sharing of evidence, knowledge, resources and activity. The National Forum is a collective of key funders and organisations involved in setting the national agenda for public engagement in STEM. Established in 2014, our goal is to improve collaboration, co-operation and learning across the sector. We want to make better collective decisions and accelerate improvements across the science engagement system. The Forum was established to help tackle sector-wide challenges that can’t be solved by people working in isolation. For instance, how to address the balance of our funding across different purposes and audiences for engagement; identifying priority areas for sustained public engagement; exploring how we can gather more useful intelligence on the long-term impact of our work; and better supporting professional development and recognition. If you can’t attend but would like to input into the Forum’s work moving forward we will shortly be circulating a sector survey. We want to hear from a wide range of people and professions, who are in some way involved in public engagement with STEM. This includes science journalists and writers, broadcasters, gamers, community practitioners, teachers and researchers. The full survey will be circulated shortly. The Autumn edition of the BIG Members' e-newsletter is now available to read here. I wrote this and thought of YOU! 10% off Science Communication Masterclass! Can you describe your PhD in a limerick? As part of BIG's role in promoting excellence in science communication we are pleased to announce our latest skills day HOW TO DEVELOP A TRAINING SESSION on Wednesday 17th October, 2018 - 9.30-4.00pm at ThinkTank, Birmingham. Find out more here. Matthew Allen has been awarded the 2018 Josh Award for science communication. 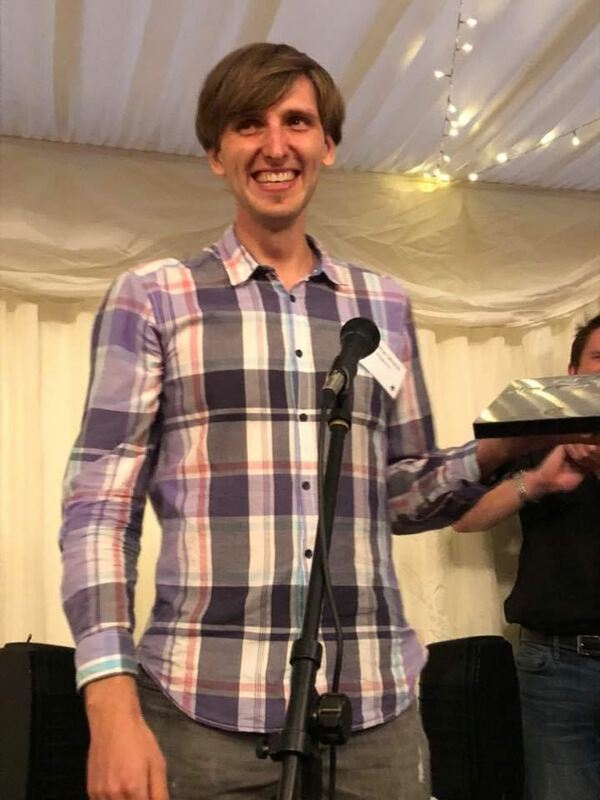 He is pictured here being presented with his award by Hannah Rose-Ford, a science communicator from the Museum of Science & Industry at the BIG Event in Winchester Science Centre. The Josh Award was established to recognise and support up-and-coming talent in science communication. The award provides the opportunity to become the science communicator in residence at the Manchester Science Festival, developing and delivering a new project or event while showcasing best practice in the field of science communication. The winner receives support to nurture their development in the field and their involvement in the Manchester Science Festival from the Festival team, the University of Salford’s Science Communication cluster, and the BIG STEM Communicators Network. The winner of the 2018 Best Demo competition is Matthias Salewski from Physikanten.